MIND CONTROL GALLERY SHOW OPENS ON AUGUST 5TH FEATURING STREET ARTISTS AND FINE ARTISTS FROM LA TO SAN FRANCISCO. 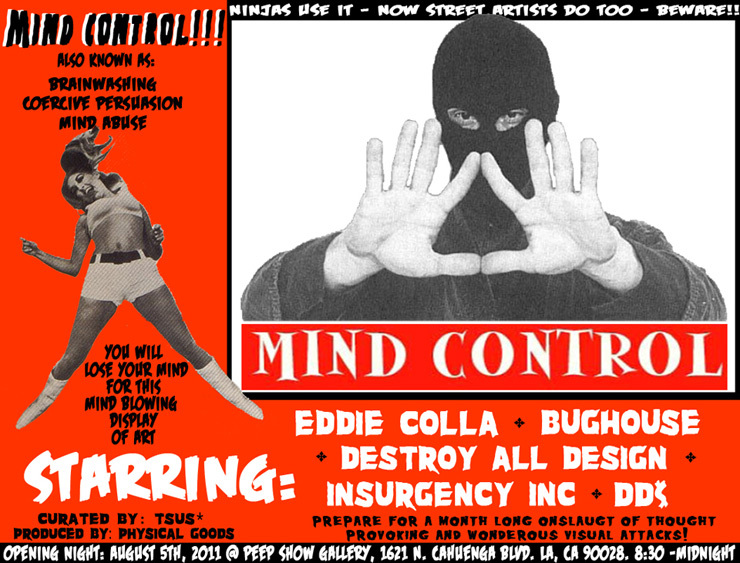 Los Angeles, California, July 12th, 2011 – On August 5th, The Site Unscene in conjunction with Physical Goods are proud to present MIND CONTROL featuring artists Eddie Colla, Bughouse, Destroy All Design, DD$ and Insurgency Inc.
Eddie Colla: There is a visual conversation that takes place on the streets of urban environments. This conversation is dominated primarily by advertising and utilitarian signage and assumes passive participation. Whether invited or not I am going to participate in this conversation. Public spaces were never intended to be coated from top to bottom with photos of consumer products. These spaces should, in some manner, reflect the culture that thrives in that space. Rebecca Johnson, one half of Bughouse was born and raised in Los Angeles. Her medium is chosen by what is most appropriate for the subject and mood, ranging from painting to mixed media to photography. Her subject matter often has a dark comedic sensibility. Jeff Klarin lives and works in Los Angeles as part of Bughouse. Exploring and pushing the boundaries of conventional fabrication and visual representation is what drives his creations. Many of his mixed-media pieces utilize photography, painting, illustration and transfer techniques that create organic ‘accidents’ that unexpectedly alter and transform the creative process. Destroy All Design: Destroy All Design’s philosophy is just that, destroy everything you know in order to realize what true design is. The joystick image, iconic to Destroy’s work, is a symbol of simplified design, represents a time when design was simple, and serves as a symbol for his visual manifesto. With a background in graffiti, it is the unique mix of writing skill combined with an expert design eye that makes his street work so recognizable and appealing. DD$: DD$, aka The Double D’s, is another incarnation of famed street crew Cyrcle. DD$ is a three man collective, each artist comes from different backgrounds of the artistic spectrum- graffiti, fine art, and design. They utilize negative and oppressive imagery to create hope and inspiration. DD$ strives to shed light on otherwise dark matters, playfully exposing the gray areas of life. INSURGENCY INC: INSURGENCY INC’s mission is to ‘force one into self-evaluation and thereby into self-motivation.’ The collective, made up of artists, writers, photographers and revolutionaries, creates art that involves the use of everyday imagery with out of context ‘lifestyle’ copy to re-appropriate the imagery in a means to evoke emotional responses, while their blog and lifestyle installations at events throughout LA intend to achieve the same within their audience’s lives. Mind Control is curated by The Site Unscene and is brought to you by Physical Goods. The Site Unscene is a new agency for a new kind of artist, which represents, aides and promotes the finest in LA street art and artists. Physical Goods is a multi-platform, artist collective, gallery/store currently based out of the Peep Show Gallery. Physical Goods, created by Brian Meiler is the future of art & retail, making great art available to the masses in unique ways.